Korea outlined action plans to tackle climate change on Tuesday (12th July), breaking down reduction targets for high-emitting sectors in the medium term. The pan-governmental plan was devised to put the country’s low-carbon, green growth initiatives in motion, which President Lee Myung-bak launched in 2009 with a goal of cutting greenhouse gas emissions by 30 percent through 2020 from 2007 levels. For the transportation sector, the target was set at 34.3 percent below business-as-usual levels. The government also aims to slash 26.9 percent from buildings, 25 percent from the public sector and 18.2 percent from industries, while saving 26.7 percent by switching to renewable electricity sources. Under the plan, the government will multiply use of solar and wind energy, smart grid, as well as carbon capture and storage technology, which involves seizing carbon dioxide from power plants and other industrial facilities using coal and gas, compressing and sequestrating it underground or under the seabed. It also plans to expand highly efficient facilities at residential and industrial complexes, and supplies of clean fuels such as liquefied natural gas, plastic scrap and biomass. As for transport, the government will foster public transportation and electric and hybrid vehicles, while stepping up fuel efficiency standards for vehicles by 2015 to 140 grams per kilometer from the current 159 grams. Green growth has been one of the key policies of the Lee administration as the country’s main economic force transitions from smokestack industries to high-tech. Korea is the world’s No. 9 polluter, with annual emissions from Asia’s fourth-largest economy doubling between 1990 and 2007 to 610 million tons, slightly greater than Australia’s. With the green growth vision, the government wants to stay at about 637 million tons through 2020, which is set to expand to 813 million tons. By sector, the government expects the largest slice to come from industries with 56 percent of the total in 2020. Buildings came second with 22 percent, followed by transportation with 13.2 percent, agriculture, forestry and fisheries with 3.6 percent and public institutions with 2.3 percent. To reach its goal, it has been promoting environmentally friendly investment and technologies, while establishing a comprehensive act on green growth. But the government faced a setback as it postponed the adoption of a carbon trading scheme known as “cap-and-trade” after 2015 amid fierce opposition from industries that it would cost too much, thus hampering their growth. Under the system, companies are required to release emissions above a government-imposed cap and to purchase extra credits from those that discharge below their quota. “The government will strive to minimize negative impacts of emission-related regulations on the industry’s competitiveness and national economy,” it said. Today, Australia exports iron ore to Asia where it is smelted with coal to produce wrought iron and finally steel. In future years, a carbon price operating within Asian and Australian economies could encourage the development of the necessary process for the production of the steel in Australia using natural gas, where that fuel is prevalent, rather than coal, as is the case in Asia today. The transfer of allowances from Asia to Australia, assuming linked carbon trading systems, would underpin any additional emissions in that country, but overall emissions between the two would be lower, thus making the project an attractive proposition. 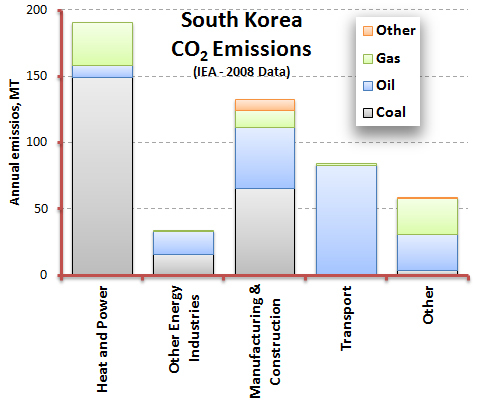 South Korea is one such economy that smelts iron ore from Australia and uses coal to do so. CO2 emissions from coal make up nearly half the emissions from the economy as a whole and fuel switching will be one of the early mechanisms implemented to reduce emissions. The switch from coal to gas in steel making is technically possible by utilizing the DRI process (Direct Reduced Iron) and while South Korea may see such a move as a relocation of jobs, Australia would undoubtedly welcome the opportunity. Building a new plant in Australia with domestic natural gas and transferring allowances through a linked system offers an alternative to the fuel switching taking place in South Korea itself, which would require the gas to be delivered as LNG. Don’t expect changes like this to happen just as these systems leave their respective starting blocks, but as linkages develop and international goals start to become recognized and delivered on, such optimization driven by the price of carbon becomes a real possibility.